elf products are more and more popular lately. This makeup mist & set works pretty good especially for the price. You can pick this up at Target for $3!! You can't really beat that, it works really good after you apply your foundation and powder you spray this. You can also use this to refresh your face throughout the day on these hot humid days. It has cucumber, aloe, vitamin A, C & E. It doesn't make your makeup run, and it really helps make it last all day. I am really surprised how well this works, and how fabulous it really is. omg, so basically a cheap fix+? 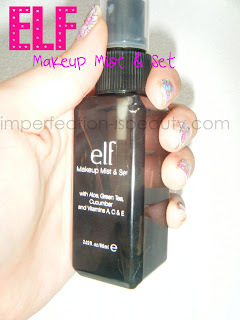 Im always a lil skeptical about it tho, but this is a good price to try a setting mist at! YES excatly like mac's fix + for the price its really nice and really makes your makeup last, but again I do love the mac fix+ better!